Building a bark trail in the native grass meadow. 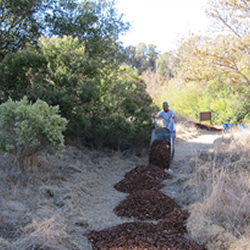 It’s time to refresh the bark path in the native grass meadow, so that park visitors can enjoy it and reduce damage to native plants. The event will take place on Saturday, October 20 from 9:00 a.m. to noon. We’ll meet in Hanns Park (entrance lot is on Skyline off Redwood Parkway). Follow signs from parking lot a short walk to the native grass meadow. Wear comfortable clothes, sturdy shoes, hat, sunscreen, and gloves. We’ll bring water, refreshments, and tools. RSVP to Info@VallejoWatershedAlliance.org. See you there!